The American Society for Gastrointestinal Endoscopy (ASGE) recognized Gastroenterology Associates, P.A., with a three-year renewed recognition status for quality and safety as part of its program specifically dedicated to promoting quality endoscopy. Gastroenterology Associates is the only endoscopy facility in the Unifour area to receive this recognition. 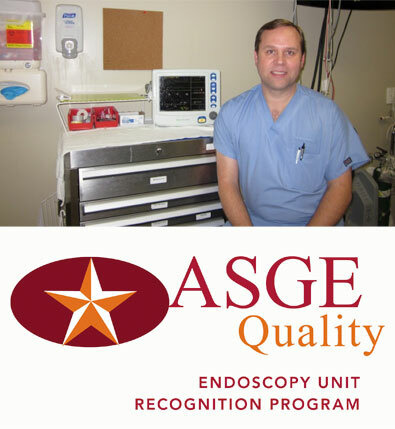 To date, more than 400 endoscopy units have been recognized by ASGE. The ASGE Endoscopy Unit Recognition Program honors endoscopy units that have demonstrated a commitment to patient safety and quality in endoscopy by meeting the program’s rigorous criteria and guidelines on privileging, quality assurance, endoscope reprocessing, CDC infection control guidelines, and ensuring endoscopy staff competency. Caroll Koscheski, MD, FACG, (right) was awarded the designation “American College of Gastroenterology Freshman Governor of the Year” at the organization’s most recent Annual Scientific Meeting held in Washington, DC. Dr. Koscheski was nominated by his peers and selected by the Chair and Vice Chair who announced the honor during the ACG Board of Governors meeting. 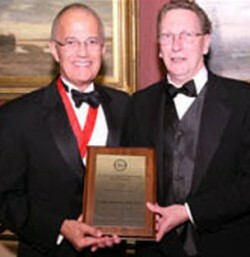 Delbert L. Chumley, MD, FACG, past president of ACG 2010-2011, presented the award. Dr. Koscheski was chosen from among 75 governors across 7 different regions in the U.S. and abroad. He is serving a three-year term as Governor which began in October 2010. Founded in 1932, the American College of Gastroenterology (ACG) is an organization with an international membership representing more than 12,000 individuals from 80 countries. Dr. John Meier, standing from left, and Dr. Caroll Koscheski, founding members of Gastroenterology Associates, honored practice manager Revonda Rand, seated left, and Jeanne Gerhardt, for 15 years of service to the practice and its patients at an awards luncheon attended by doctors and staff. 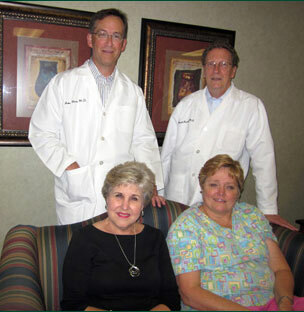 Both women have been with the practice since it opened in 1996. Revonda Rand worked full-time in the business office while she completed her certification in medical office management at Catawba Valley Community College. After working as assistant manager for two years, she was promoted to practice manager in 2002. Jeanne Gerhardt supervises the clinical area nursing staff, performs specialized testing, and conducts the initial teaching for hepatitis C patients. She is a graduate of the nursing program at Catawba Valley Community College. “The growth of our practice could never have happened without the daily hard work and caring of our employees. These two women have been instrumental to our success,” said Dr. Caroll Koscheski and Dr. John Meier. “Gastroenterology Associates is extremely grateful to these two very dedicated employees,” added Dr. Koscheski. 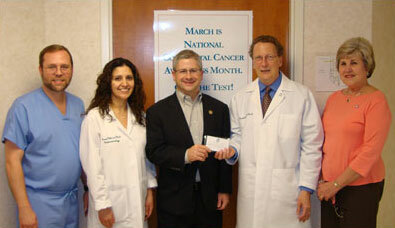 Congressman Patrick McHenry, 10th District of North Carolina, visited with physicians and administration of Gastroenterology Associates to promote Colon Cancer Awareness month. The staff welcomed the Congressman whose visit also tied in with National Gastroenterology Nurses and Associates Day. 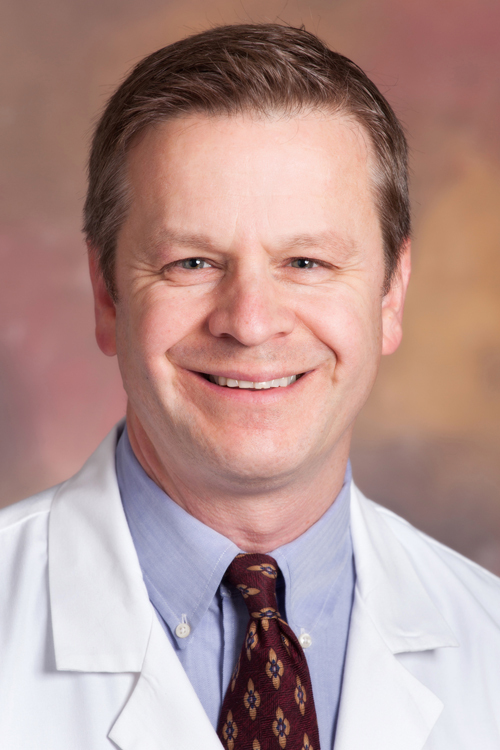 Frank Wright, MD, received fellowship designation (FACG) from the American College of Gastroenterology. Recipients are selected based on significant professional achievement and superior competence within the field of gastroenterology. Dr. Wright joins two other physicians at our practice who are also designated fellows, Dr. John Meier and Dr. Caroll Koscheski. The American College of Gastroenterology is an international organization seeking to advance the medical treatment and scientific study of gastrointestinal disorders.